Been a bit lacking in posts this month but I've found it difficult to sit down and think of what to say. I've been losing myself in books instead, it helps me not think about all the rubbish going on right now. Anyway, thought I'd pop up a post of one of my absolute must have products. I purchased this myself a couple of years ago when I first went to a M.A.C counter, then my best friend bought it for me for one of my birthdays. What good taste he has! It's long been a favourite of mine. Parfait Amour (which translates as Perfect Love - how fitting!) is a very blue based violet with a smattering of pink duochrome, which unfortunately my pictures fail to show. But it's the same sort of shade as Pink Opal pigment. It's also a frost finish. I absolutely love this shade and whilst I know it's not for everyone, I couldn't be without it. The finish means you can either have it as a sheer colour or really build it up and have something bolder. One of my favourite ways to wear it is with a whole load of purples, see here. It lasts perfectly when popped on top of a primer and blends easily with other shadows. 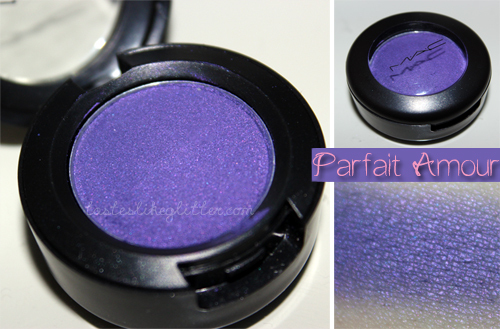 I really do recommend checking out this shadow if you love purples on the eyes. I think it's a bit of a hidden gem as I haven't heard to many people rave on about it. What's your staple coloured eyeshadow?